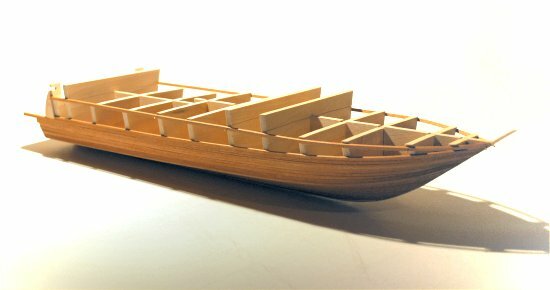 Precise templates are created for the ribs or bulk-heads required to build an accurate and true-scale hull. Those sections are then created in wood and placed in position on the keel. The keel itself is often built-up from several scarfed pieces, very much like the original. A variety of grades and types of hard- and soft-woods are used, depending on purpose, location and function. Wood grain is also a factor since the grain has to look natural at scale, but of course only when visible. The sections are shaped and sanded to allow for planking to be applied in a smooth and fluent manner. Additionally, cant frames and breast hooks are also often used in a model's construction. The picture above shows the hull construction of an early 19th century brig. 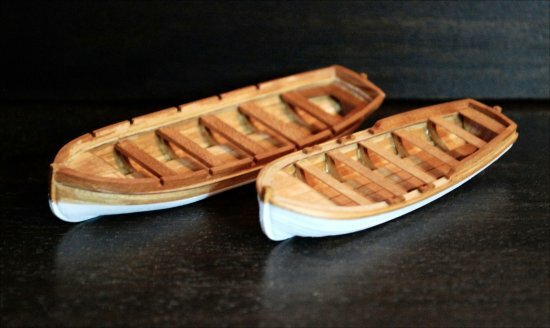 The clinker and carvel hulls of two 18th century ship model boats shown below. Hull construction of a modern Johnson 75 motor yacht model shown below. After a yacht hull has been completely planked, she is sanded smooth and faired. Then the hull is coated with an epoxy-resin recipe, creating an incredibly strong, smooth and resilient hull.